We know Toshiba for its many electronic devices, from television to laptop computers. So when it introduced its TransMemory lineup in 2007, many of us were anxious to know what the renowned company would bring to the table. While the flash drive series didn’t do much to wow consumers, we forgave Toshiba for these underwhelming products. Now the company has resuscitated that lineup with the Toshiba TransMemory-EX USB 3.0 flash drive, which was finally introduced at CES 2012 in Las Vegas. Flaunting its compliance with the USB 3.0 standards, the Toshiba flash drive meets users’ need for portability of video content and other large data which can now be transferred to other digital products with a speed of faster than older models. The new kit utilizes Toshiba’s DDR NAND, allowing transfer rates of 220 MB/sec for reading and 94 MB/sec for writing or 22 times and 18 times faster transfer rates, respectively, when compared with Toshiba’s previous models running on USB 2.0. And it does all the hard work without consuming more than 300 mA of power. The device is an especially practical option now that consumers are keen to storing huge amounts of video content to chronicle their personal and professional lives. This is even more magnified with the availability of social networks that allow everyone to upload their own pieces of video artwork. Furthermore, the countless sites where everyone can download torrent files have increased the need for consumers to find a faster way to store and transfer their data. The USB 3.0 device is backward compatible so you do not have to worry if your laptop is running on USB 2.0, but we do recommend you start investing in a laptop with the faster interface now that it’s becoming more prevalent. The Toshiba TransMemory-EX USB 3.0 flash drive will be available in 32 GB and 64 GB, and shall be priced at $102 and $192, respectively. No word yet from Toshiba on when it will hit the market. It’s a solid product from Toshiba, but with that being said, we’ve witnessed faster USB 3.0 flash drives and we’ve also seen better designs and fancier features. Maybe it’s a lack of the right marketing panache, but it remains to be seen how the average user will respond to it. 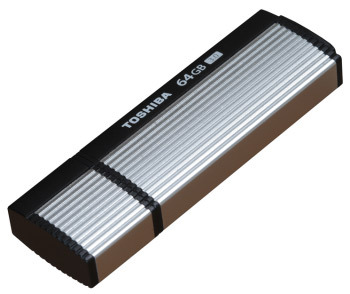 Is the Toshiba flash drive worth the wait? Why or why not? Let us know your thoughts! This entry was posted in Articles, CES 2012, SuperSpeed USB 3.0, Toshiba, USB 3.0, USB 3.0 Flash Drives and tagged Toshiba DDR NAND, Toshiba flash drive, Toshiba Transmemory-EX USB 3.0 Flash Drive, Toshiba USB 3.0 Flash Drives, USB 3.0 device, USB 3.0 Flash Drives. Bookmark the permalink.